Ideal for children of all ages, this Peacock and Doe 4-plate set attracts the young and old alike with the beauty of its refined and delicately coloured drawings. Stealing the show are the pastel shades of pink and blue, while the subjects chosen are a fascinating peacock with multi-coloured tail and a gentle doe with a gentle and kind face. Designed for children but loved by adults as well, the 4 Peacock and Doe plates are made entirely of bamboo: a completely natural, eco-friendly and biodegradable material, which protects not only our planet but also the health of our children. Bamboo is capable of ensuring hygiene and safety, while the special productive process used for these dishes guarantees total reliability when in contact with food. The producers of the set, creative Australian brand Love Mae, have had each plate undergo a unique treatment that, just like with porcelain, consists of a double firing production. In this way they become particularly robust and durable as well as more sturdy, being completely free of phthalates and other harmful substances to the body. In addition, the colours used for the designs of edible resins are perfect for surfaces that come in contact with food for children. 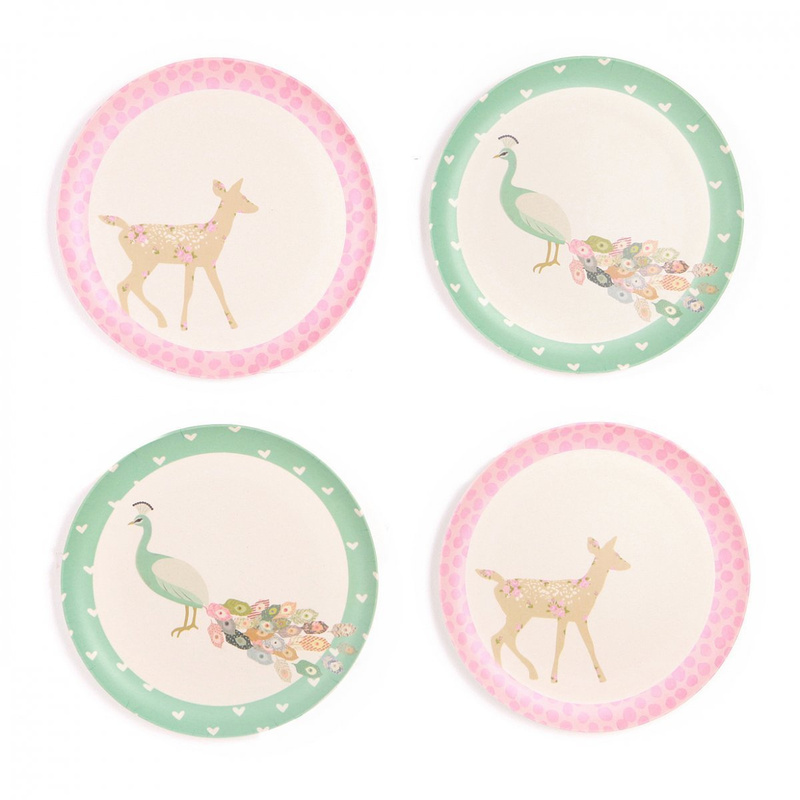 The 4 Peacock and Doe plates are a treat for your kids or as gifts for couples. They have a highly decorative appeal, they work magic on children and leave mothers at ease. The dishes are also dishwasher safe and come with a stain-resistant surface that repels grease and odour. Love Mae's designers feel passionate about respecting the Earth, while minding aesthetics, too. They take seriously their roles as caretakers for the next generation, making every product biodegradable. It has taken a lot of determination to achieve this goal, which will be surely appreciated by all those consumers who also take action into their own hands.